A French town that was the scene of a jihadist shooting spree earlier this year has been swamped by floods, with one local woman known to have lost her husband in the attack and her parents in the latest disaster, officials said Tuesday. The sleepy medieval town of Trebes was targeted by a gunman in March who killed four people during a rampage that saw him take shoppers and staff hostage at a local supermarket. The attack became a focus of global attention when a police officer at the scene, 44-year-old Arnaud Beltrame, agreed to swap himself for a hostage before being killed by the gunman, who claimed allegiance to the Islamic State group. Seven months later, the Super U supermarket, like much else in Trebes, has been swamped by devastating storms that ripped through the region of southwest France near the city of Carcassonne on Sunday night. 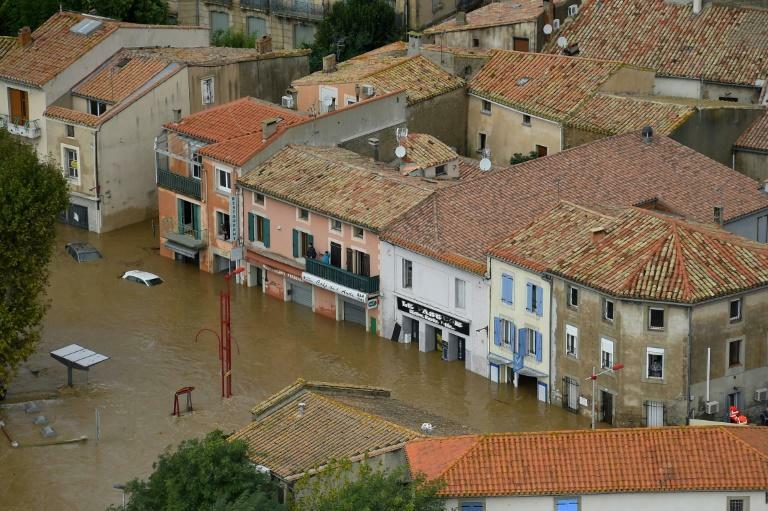 At least 11 people have died in the flooding in the Aude area of France and three people are missing after violent rainstorms turned the normally placid local rivers into raging torrents that washed away bridges, roads and homes. One resident in Trebes has suffered a triple bereavement in the terror attack and flooding, local officials and neighbours told AFP on Tuesday. Her husband, a 61-year-old retired winemaker named Jean Mazieres, was the first victim of the jihadist after he was shot dead in a parked car in an apparently random shooting. The woman's elderly parents, both in their 80s, were washed away Monday by waters of the Aude river, which officials say rose eight metres (26 feet) in just five hours. "It's horrible. The widow has lost both her parents," a neighbour, Valerie Puerta, told AFP. "Every day a nurse would come to check on the couple. They lived by the river in Trebes."